Gov. Dunleavy Couldn’t Make it to Noorvik for His Inauguration. In Noorvik, the Ceremony Happened Anyway. Due to hazardous flying conditions, Governor Mike Dunleavy couldn’t make it to Noorvik for his official inauguration this morning as planned. But shortly after his impromptu Kotzebue swearing-in, he did finally arrive in Noorvik, where he and his family received a warm welcome. Rose Dunleavy is from Noorvik, and the entire village seemed to rejoice to welcome her home. While seats on stage meant for Dunleavy, Kevin Meyer, and their families remained empty this morning, the Noorvik Ceremony went on as planned. A group of children led by community member Lloyd Morris recited the pledge of allegiance in Inupiaq, and sang “My Country, ‘Tis of Thee,” also in Inupiaq. Around 1:20 p.m. this afternoon, the governor’s plane landed safely in Noorvik and he, his wife Rose, and his children made their way to the school gym. Dunleavy, Meyer, and family spent a couple hours in Noorvik celebrating with the community before heading back on a charter flight home to Anchorage. 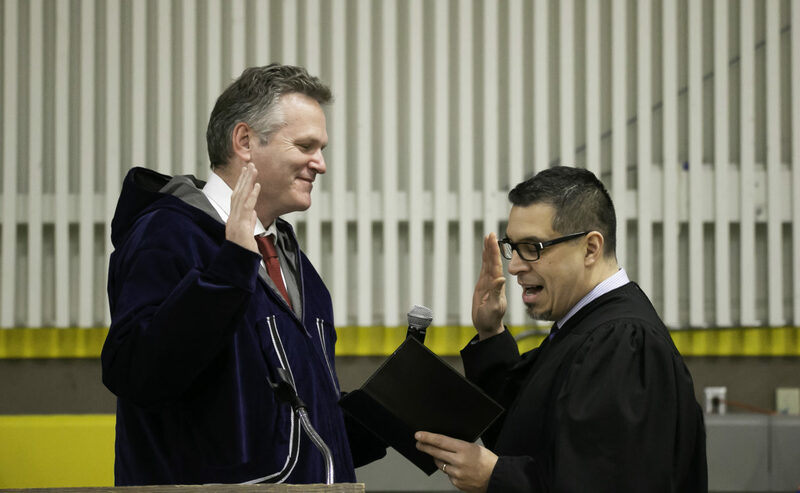 Image at top: Governor Mike Dunleavy is sworn into office on Monday, December 3. Photo: Stanley Wright.